It’s been a while since I wrote a blog. My lack of time and electricity are the reasons for this, but Irie’s engine is running at the moment and we put a temporary halt to being busy bees at our destination for the season. The longer in between blogs, the more that happened and that I should write about, but I’ll try to keep this one on the shorter side. St. Lucia came as a pleasant surprise for two reasons. Darwin was allowed to enter the country with his paperwork and current vaccinations, after a government vet inspected him and produced an import permit. The second reason was the appearance of the island itself. Since, we never really expected to visit, we didn’t really think much about it. 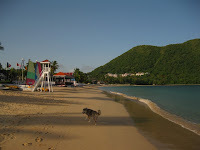 So, when we anchored in Rodney Bay as our first stop, we were amazed at the friendliness of the locals. Despite it being a resort area, walking Darwin on the nice, long beach was a pleasure, because of the beautiful stretch of sand, the relaxed atmosphere and the smiling faces around us. It was a pity we only stayed two nights, but … we were on a mission to go south. August had approached and together with September, these are the worst months of the hurricane season. 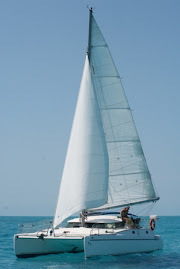 Marigot Bay is described as one of the most beautiful anchorages in the Caribbean. The surroundings are, indeed, very pretty, with a beachy peninsula full of palms. Anchoring is pretty limited however, between the deep water and the amount of mooring balls everywhere. The recently built marina is buying all the surrounding land and kicking out the locals, making for a grim environment. The only afternoon we were there, we cooled off in the clear water and hung out with a few young St. Lucians, sharing stories and future plans in the shade of the palm trees. 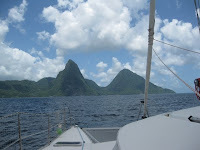 The Pitons are THE landmark of the island and the most photographed one. Together with the seas around Soufrière and north, it is part of a Marine Management Area. After paying the fees, boaters are allowed to visit and use the mooring balls. Contrary to our other shore visits, Soufrière didn’t give us a very positive impression. The locals were very pushy and the town dirty. The surrounding views, however, were very photogenic and impressive. Next time, we hope to spend a bit more time around the Pitons. For a few weeks we’d been trying to contact the agriculture department of St. Vincent and the Grenadines, the next set of islands and the most popular ones. 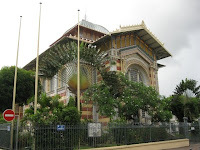 The Grenadines are the highlight of many a cruiser and we really hoped we could visit them, but that all depended on obtaining a permit for Darwin. The rules are very strict and a bit ridiculous, but we wrote a long letter explaining why Darwin and his optimal health would not be a threat to the country. Since we didn’t hear anything back by the time we were ready to depart St. Lucia, we had to skip the “Caribbean from the pictures”. 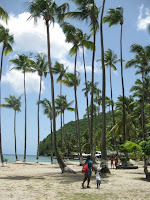 No picturesque Bequia, no amazing beaches lined with palm trees and no wonderful snorkeling on the coral atolls (yet?). Then, on the 5th of August, we arrived in Carriacou, the northernmost island of Grenada. When we checked our emails, we found out that Darwin’s permit for St. Vincent and the Grenadines, coming from St. Lucia (another rabies free country) was getting processed and that just a bit more information was needed! Talking about bad timing… Having reached the shores of our final destination, our fast pace and constant moving would come to an end. Right?